Service Law–Punishment–Bank Employee had submitted certificate that she had passed CAIIB Part II Examination-in departmental enquiry and inquiry by Court it was found that said certificate was forged document-Order of dismissal from service cannot be held to be disproportionate. Comments Off on Service Law–Punishment–Bank Employee had submitted certificate that she had passed CAIIB Part II Examination-in departmental enquiry and inquiry by Court it was found that said certificate was forged document-Order of dismissal from service cannot be held to be disproportionate. 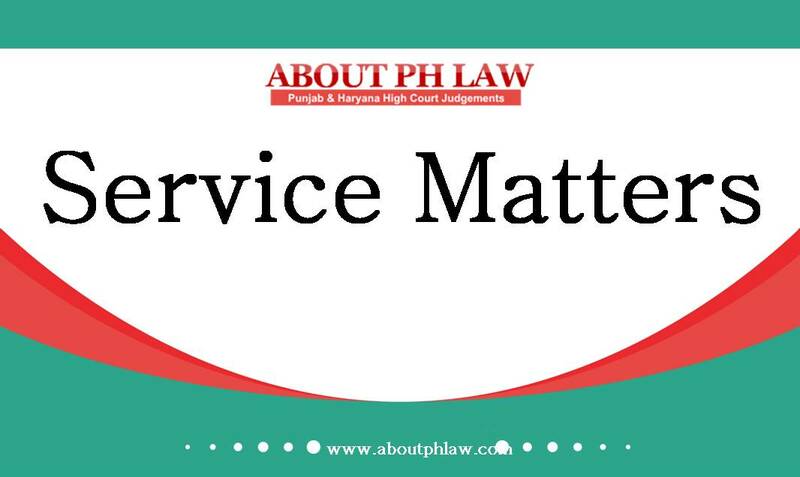 Service Law–Termination–Notice of a mere 24 hours was given to the Respondent before the order of termination was passed–it was in clear violation of principles of natural justice as reasonable opportunity was not given to respondent to furnish her explanation-Termination order set aside. Comments Off on Service Law–Termination–Notice of a mere 24 hours was given to the Respondent before the order of termination was passed–it was in clear violation of principles of natural justice as reasonable opportunity was not given to respondent to furnish her explanation-Termination order set aside. Service Law-Removal from Service-Notice-There is no requirement of a second show cause notice before imposition of a penalty. Comments Off on Service Law-Removal from Service-Notice-There is no requirement of a second show cause notice before imposition of a penalty. Service Law—Superannuation—Parity-Assistant Public Prosecutors are not entitled to be treated at par with Public Prosecutors and other officers whose age of superannuation is specified at 60 years— The fact that the nature of duties and functions of Assistant Public Prosecutors and Public Prosecutors are similar, per se, cannot be the basis to claim parity with Public Prosecutors in respect of age of superannuation. Comments Off on Service Law—Superannuation—Parity-Assistant Public Prosecutors are not entitled to be treated at par with Public Prosecutors and other officers whose age of superannuation is specified at 60 years— The fact that the nature of duties and functions of Assistant Public Prosecutors and Public Prosecutors are similar, per se, cannot be the basis to claim parity with Public Prosecutors in respect of age of superannuation. Service Law—Appointment—New post of Chief Principal Secretary to the Chief Minister —Standing order that powers vested in Principal Secretary to Chief Minister would be exercised by ‘CPSCM’ during absence of Chief Minister-­Sovereign functions of the state cannot be delegated to a person who does not have the mandate of the people—Appointment held to be invalid and is set aside. Service Law—Appointment—Judicial Review—Requirements of Article 14 are attracted in sphere of contractual appointments as well. Service Law—Appointment—Judicial Review—While examining the validity of appointment of a person to a high official position in the State hierarchy, High Court is competent to consider whether a writ ‘in the nature’of quo-warranto needs to be issued. Comments Off on Service Law—Appointment—New post of Chief Principal Secretary to the Chief Minister —Standing order that powers vested in Principal Secretary to Chief Minister would be exercised by ‘CPSCM’ during absence of Chief Minister-­Sovereign functions of the state cannot be delegated to a person who does not have the mandate of the people—Appointment held to be invalid and is set aside. Service Law—Appointment—Judicial Review—Requirements of Article 14 are attracted in sphere of contractual appointments as well. Service Law—Appointment—Judicial Review—While examining the validity of appointment of a person to a high official position in the State hierarchy, High Court is competent to consider whether a writ ‘in the nature’of quo-warranto needs to be issued. Service Law–Selection–NDA Course-Armed Forces-Candidate cleared the exam but was found unfit by medical board-Review from an independent body found him fit-Candidate permitted to join the course from next session as an exceptional case. Comments Off on Service Law–Selection–NDA Course-Armed Forces-Candidate cleared the exam but was found unfit by medical board-Review from an independent body found him fit-Candidate permitted to join the course from next session as an exceptional case. Service Law—Appointment—Acquittal in criminal case—Does not automatically entitle him for appointment to the post. Comments Off on Service Law—Appointment—Acquittal in criminal case—Does not automatically entitle him for appointment to the post. Law Officers—Appointment of—Directions issued to State of Punjab and Haryana to frame policy and till then a selection committee would short list the applications and recommend it to committee of Judges which would further be sent to Chief Justice for his views—State Government shall then appoint the candidate on basis of views expressed by Chief Justice on suitability—All fresh and re appointments to be done under this process. Comments Off on Law Officers—Appointment of—Directions issued to State of Punjab and Haryana to frame policy and till then a selection committee would short list the applications and recommend it to committee of Judges which would further be sent to Chief Justice for his views—State Government shall then appoint the candidate on basis of views expressed by Chief Justice on suitability—All fresh and re appointments to be done under this process. Voluntary Retirement Scheme–Pension -Employees who apply for voluntary retirement after serving a minimum period of 15 years under a special/adhoc scheme formulated with the specific approval of the Government and the Board of Directors, will be eligible for pro-rata pension for the period of service rendered as if they are to retire on attaining the age of superannuation on that date. Comments Off on Voluntary Retirement Scheme–Pension -Employees who apply for voluntary retirement after serving a minimum period of 15 years under a special/adhoc scheme formulated with the specific approval of the Government and the Board of Directors, will be eligible for pro-rata pension for the period of service rendered as if they are to retire on attaining the age of superannuation on that date. Select List–Where rules do not specify the validity of select list, the validity of select list should be one year. Comments Off on Select List–Where rules do not specify the validity of select list, the validity of select list should be one year. Termination–Reservation–In advertisement, authorities failed to mention in regard to reservation for handicapped person at the outset–Appellants who were handicapped person were appointed–On Contempt petition State cancelled the selection and terminated the service–Service restored with backwages. Comments Off on Termination–Reservation–In advertisement, authorities failed to mention in regard to reservation for handicapped person at the outset–Appellants who were handicapped person were appointed–On Contempt petition State cancelled the selection and terminated the service–Service restored with backwages. Dearness Allowance–Directly recruited co-ordinators held entitled to the same benefits as given to co-ordinators appointed on deputation. Comments Off on Dearness Allowance–Directly recruited co-ordinators held entitled to the same benefits as given to co-ordinators appointed on deputation.